Lisa Gansky, author of The Mesh: Why the Future of Business is Sharing and founder of Mesh Labs, on the sharing economy. For Lisa Gansky, that future is all about sharing. The Sharing Economy, what Lisa calls “the Mesh,” is taking root around the world in the form of thousands of businesses and organizations that understand and cleverly exploit the perfect storm of mobile, location-based technology, social networks, and an evolving ethos of community and citizenship. The Mesh isn’t just about offering consumers more choices, more tools, more information, and more power—it’s also fundamentally transforming what it means to win, the nature of competition, and how value is created. Just as in kindergarten, sharing is not an optional activity. The Sharing Economy is infiltrating every realm of endeavor with inventive solutions in sync with the values of community, connection, sustainability, generosity, quality, and simplicity. How does the Mesh transform what it means to win, how we create value, and the very nature of competition? What does it mean to be a Mesh organization? What are the principles and values at the heart of the Mesh? What are the shining examples of the Sharing Economy at work? What can every leader and organization learn from the Mesh—how do even the most traditional, entrenched organizations migrate from the “ownership” model to the Mesh? How do you “mesh yourself” as an individual leader, consumer, or contributor? 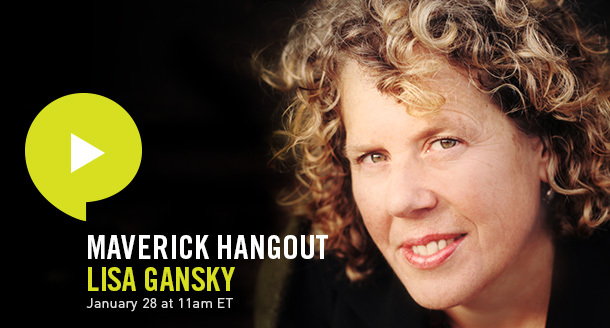 Participating in the Hangout is as easy as coming back to this link on Tuesday, January 28 at 11am ET. Lisa will be answering your questions, so please post them in advance in the comments section here (and via Twitter during the Hangout #MIXhangout). What is the specific difference between the idea of "Mesh" and "Open innovation"? Given the structure of capitalism, how countries, businesses and people with different level of development and needs and wants going to balance their interaction in a sharing economy? While there is a wrong categorization of academic and business concepts, countries and nations and in a smaller scale false classification of citizenship degree in organizations and given the interests of C level executives, how sharing is going to take place in a large scale as sharing economy in that sense? mesh can happen if there is sufficient trust among all parties and this takes place while people can read each other's mind and definitely not in a situation some parties spying others to exploit and causing distrust. How do we create a Low-Stress Environmental Ecosystem in the work place?